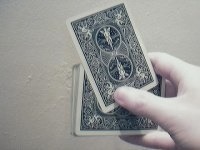 The cards are gripped between the little-finger and the index-finger, the same way if you clip the card in your hand as you prepare to make a one handed fan (straddle grip). 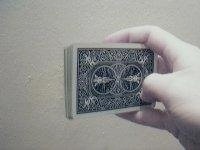 By giving pressure with the fingers on the front side of the cards, the cards are bend forward. (curved horizontal). The index and the pinky gives pressure to the deck. The thumb has a short cut nail and with the tip of the thumb you snap up the card in a C-motion. The index finger acts like a pivot, causes the card to shoot from the deck. 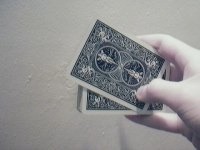 Multiple cardshooting at the same action is achieved by pushing the top card a bit further from the deck to the left and by pressing on the border of the overlapping cards on the right, 2 or more cards can be shot from the deck. •With an angle: the cards behave like a boomerang card and returns to the performer. •Behind your back: makes the card shoot from the back to the front of your body. 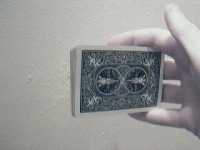 •Behind your head: The arm is bent over the head and shoots the card from the deck which makes the card to get back upside down.